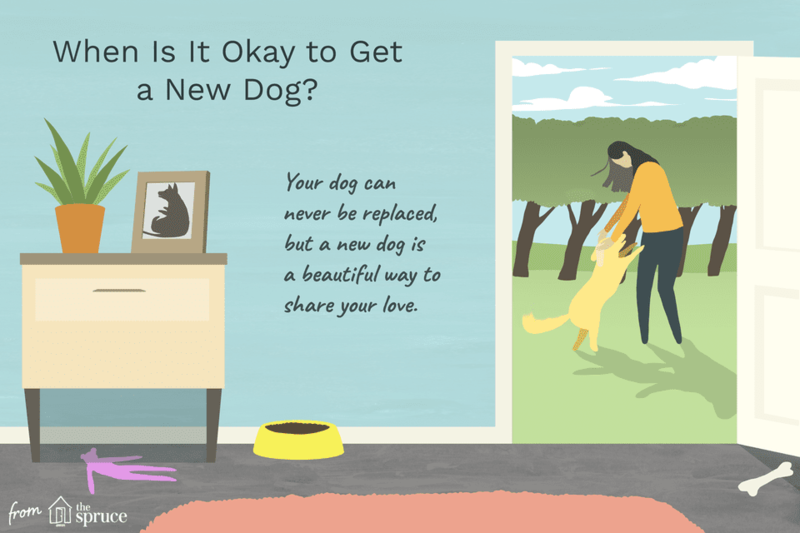 When Should You Get Another Dog After Your Dog Dies? The death of a beloved pet is heartbreaking and the grief does not go away overnight. Many owners struggle with the decision to get a new dog. How long should you wait before getting your next dog? Will you ever be ready to share your life with another dog? There is no way to say for certain when the time is right to get a new dog. This is a very individual decision that often happens organically. Some people only wait days to weeks, possibly because they cannot bear to go long without a canine companion. Others need several months to years before they are ready to bring a new dog into their lives. Some people even decide they no longer wish to have dogs. The situation is different for everyone. However, here are some guidelines that might help you make the decision that's right for you. First of all, take the time to experience your grief. It's normal to be sad, angry, or lonely for a while. It's also okay to feel relieved and sad at the same time, especially in cases when your recently deceased dog suffered from a long or serious illness. Avoid trying to immediately fill the void with a new dog when you have not processed your feelings over the loss of your last dog. You might end up projecting negative feelings onto your new dog or having unreasonable expectations. Instead, wait until you feel a sense of peace about your previous dog's death. Yes, you may still be grieving. However, it's best to be at a place where you are processing your grief and it does not dominate your life. Consider the other people living in your home. Your spouse, partner, significant other, children, roommates, and other family members should have a voice. Are they ready to welcome a new dog into the home? Are they still grieving? The decision to get a new dog should be one you make as a group. Have household meetings to discuss what is on the minds of everyone in the home. Once you can all agree to get a new dog, you can then discuss details like what kind of dog to get and where to get the new dog. Choosing your new dog should also be a group process. If you have any remaining pets, consider them before you add another dog to your home. Remember, that dogs grieve too (and so do other pets). Your dog (or other pet) may feel sad and lonely without his companion, but that doesn't mean a new dog will help. In some cases, bringing a new dog in the home before your dog is ready can cause quite a disruption. Watch your remaining pets closely for the days to weeks following your previous dog's death. Look for subtle changes in personality, activity level and appetite. Make sure they are not showing any signs of illness. Once you are confident they are back to their normal selves, only then should you consider adding a new dog to your home. Once you get your new dog, be sure to introduce all pets gradually and carefully. Try to get an idea of what your life is now like without your dog. Are there goals or plans that you put off because of the care your previous dog needed? Maybe now is the time to take that long vacation or sabbatical. Does your home need repairs or renovations? Perhaps it's a good time to revisit previous plans for going back to school, changing jobs, or relocating. It's better to make any lifestyle changes before adding a new dog to your life. Then, if and when the time is right, you can find a dog that is right for your new lifestyle. Consider the new set of responsibilities that will come with a new dog. It will take time to help your new dog adjust to a new environment. You will likely need to work on some training as well. Your new dog may need more exercise than you are used to, especially if your previous dog was a senior. Because you likely had many years with your previous dog, his care may have become a matter of routine for you. A new dog will have a whole new set of needs, many of which may be unexpected. Therefore, you should make sure you are prepared to make lifestyle adjustments if necessary. It may even be a good idea to approach this as if you were getting a dog for the first time. Once you feel that the time is right, you can begin the process of choosing the right dog. Avoid running out and getting the first dog you meet and like. Before you look for a new dog, determine the age, personality, energy level, and size of your ideal dog. Decide what factors are the most and least important to you. ​Adopting a dog can be a wonderful idea. Many dogs in rescue groups have been living in foster homes. The foster owners can usually give you a pretty good idea of what to expect from each dog. Your beloved dog can never be replaced, but a new dog can be a beautiful way to share the love in your heart. Some people find that the heartbreak of losing a dog was too difficult to ever go through again. Sadly, they may choose to no longer have pets. However, most people realize that they want to continue sharing their lives with dogs. By opening your life up to a new dog in need of a home, you are honoring your dog's memory. The human-canine bond is a beautiful thing. Do Dogs Grieve Over the Loss of Other Pets?